Wanting to Build Or Renovate Your Home, But Don’t Know Where To Start? This Book Is For You! Everyone is looking for a home renovation guide and improvement ideas. We all undertake home improvement projects from small changes to major home renovations or makeovers, with some embarking on building a new home. This home renovation guide will help you build your dream home without mistakes. Building or renovating a house should be exciting. It will be challenging, but it will end successfully if planned correctly. Building a home or renovating a home is going to be one of the largest investments you make – both emotionally and financially, so it’s important to get it right. The last thing you want is a project that is riddled with errors, pitfalls and spiralling costs due to incompetent building contractors and poor construction management. Successful home renovation can also be a demanding process, requiring strict management to ensure that your budget remains intact and that the home design you envisaged comes to fruition in a timely and cost-effective manner. “Build & Renovate Your Home with Your Eyes Wide Open” aims to ensure that you are properly prepared when it comes time to build or renovate your home whether you are employing a building contractor or doing the construction yourself. 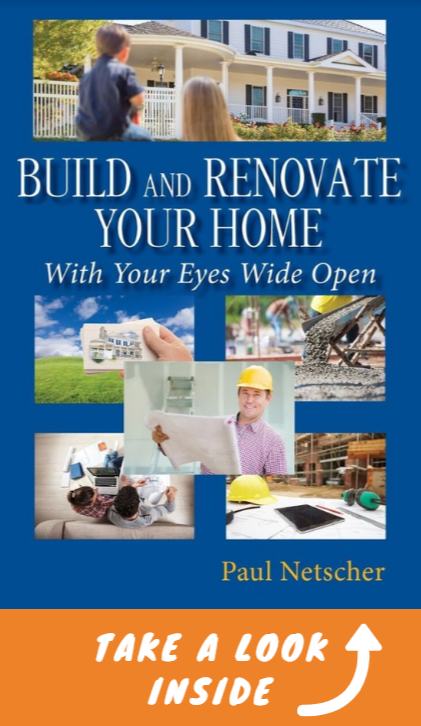 With 30 years’ experience in the construction management industry, author of several acclaimed construction management books and a home owner, my vast amount of insights, ideas and knowledge has been compiled into a home building guide to give the reader an in-depth understanding as to the elements required for a successful home construction project. This home renovation and home building guide also includes practical tips to teach you what to lookout for during the build and renovation process, helping to save you thousands and avoid problems. some common home building problems and how you can avoid them. Home build projects are different, we all have different requirements and we have differing building skills and construction management abilities. There is no perfect solution for everyone, so I present diverse construction options and solutions with their pros and cons so that you can make the best decisions for you, your family, and your new home. Armed with the knowledge in this book , a successful home renovation or home construction project can be achieved.